(New York, NY) Acquavella Galleries is pleased to present Jean-Michel Basquiat Drawing: Work from the Schorr Family Collection, an exhibition of works by Jean-Michel Basquiat curated by Fred Hoffman from May 1 to June 13, 2014. The show will feature 22 works on paper and two paintings from the collection of Herbert and Lenore Schorr, who were the artist’s devoted collectors, supporters, and friends. "We have had the pleasure of knowing Herb and Lenore Schorr for over thirty years, and are delighted to present the first exhibition on their important collection of works by Jean-Michel Basquiat,” said William Acquavella. “Focusing on the significance of drawing in Basquiat's practice, we are pleased to show these remarkable works on paper, many of which are being exhibited to the public for the first time." Basquiat showed an affinity for drawing at an early age and this practice was a central component of his artistic output. Between 1980-88, the artist produced approximately 1000 works on paper, which articulate complex narratives, revealing flawed power structures and hinting at fundamental failings in social discourse. The portrait of Herbert and Lenore Schorr that will be included in the exhibition highlights the impact their support had on the artist’s short but prolific career. “We had so much confidence in him from the beginning and couldn’t understand why other people couldn’t see it,” explained Lenore Schorr. “A wonderful exhibition that he did at Fun Gallery in 1983 didn’t receive a single review and we were the only ones to buy a painting.” That painting, Leonardo da Vinci’s Greatest Hits is now considered a seminal example of the artist’s work and will be one of two paintings on view. 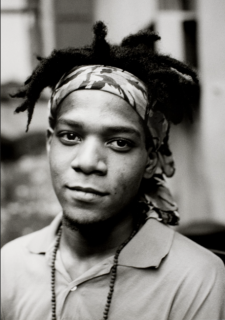 Curator Fred Hoffman, Ph.D. met Jean-Michel Basquiat in 1982 and worked closely with him during the artist’s residency in Venice, California from 1982-84. With Hoffman's help, Basquiat produced five editions of prints, published in 1983 by New City Editions. Hoffman also assisted in the production of the artist’s 1984 silkscreen paintings and co-curated Basquiat’s retrospective at the Brooklyn Museum in 2005. He is the Ahmanson Curatorial Fellow at the Museum of Contemporary Art, Los Angeles. Jean-Michel Basquiat (b.1960 d.1988) has been the subject of numerous major museum exhibitions throughout the United States and Europe. In 2005, a retrospective exhibition, Basquiat, opened at the Brooklyn Museum of Art, and subsequently traveled to the Museum of Contemporary Art, Los Angeles and the Museum of Fine Arts, Houston. A 2010 retrospective, organized by the Fondation Beyeler in collaboration with the Musée d’Art Moderne de la Ville de Paris, marked what would have been Basquiat’s 50th birthday. His work is included in private and public collections throughout the world, including The Broad Art Foundation, Santa Monica; Centre Georges Pompidou, Paris; Museu d' art Contemporani de Barcelona, Spain; and The Museum of Modern Art, New York. A fully illustrated catalogue with an essay by Fred Hoffman will accompany the exhibition.